We have been informed that the municipality (Belediye) of Lapta is now starting with a new system of water billing. The old mechanical water meters have been changed to new so-called “Smart Electronical Water Meters” and the customers do not any longer receive the traditional bills for their water consumption but buy credit in advance on a smart card (similar to prepaid mobile phones). We have no information if this project is yet finished in all parts of Lapta but customers have already got emails from the municipality with the information shown below. The system has been revised and improved. There is no more builder’s tariff, all houses are all normal house tariff. Before every 10 tons up to 40 tons the tariff would change and water per ton would get more expensive; this has also been removed and now there is only one set value for water and that is 3 TL per ton no matter how much water you buy. If you buy 10 tons of water which is 30TL, you may use this water however long which it lasts for. In other words the “standard charge” for water which was for zero to 10 tons has been removed. The pest control (sağlık) is 8.34 TL per month or 100 TL per year. And garbage is 20 TL the first six months of the year and there is no charge for the rest of the year, so the yearly charge for garbage collection is 120TL. Property tax charges and procedures have not changed and is continued in the same way. You may find the English Manual of the smart meters attached to the email. If you have any other questions please do not hesitate to ask us, thank you. Thank goodness we have at long last had some information in print which we can refer to. Up to now there has been so much conflicting misinformation, including that in the press which staff at the Belediysei refuse to recognise. Bless you for your proactive article. We,certainly, have not received an email with this information. Maybe the Belediye does not have your email-address? I think you´re not the only one in Lapta not having got this information, that´s why I published it. Thank you for information I wish that the meters had an English translation on them too. I hear next is digital electric meters!!!!! Yes, you are right, we already wrote about these digital electric meters. Thank you very much for sharing this. 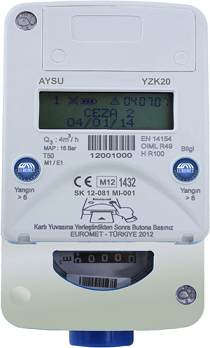 We do not have our meters yet, but they are working their way through Karsiyaka and ours will come. Glad to have the English Manual.